The summer of 1991 brought a real change from adidas. There was a new logo, with the adidas Equipment marque replacing the trefoil, while aggressive kit branding saw the three-stripe motif really ramped up. Among those given the new design were Bayern Munich, Liverpool, Olympique de Marseille and the USA (though with three different adidas logo placements across these four kits). The following year’s European Championship in Sweden would see the Equipment line expanded, as France and the CIS had a design which featured sets of bars over each shoulder and Germany premiered a relatively tidier style, which limited the exuberance to the sleeves). However, this was still a period when local adidas branches had more input, meaning that there were a few kits from the time when the old and new adidas worlds meshed together. In Ireland, Cork City began 1991-92 with a style which foreshadowed the second generation of Equipment designs, launched in 1993. City’s kit was modifed during that season to resemble the ‘proper’ look, though the stripes – cut versions of the full-length ones – were angled differently. Look again at that initial City shirt though and you’ll see that it carried the trefoil rather than Equipment logo. And they weren’t the only ones, as we can see from three international kits. Norway’s really sticks out, given that they applied the traditional stripes and the trefoil to what was essentially an Arsenal shirt – the style also used by Germany – with a matching away top. See this fine Pyro on The Pitch piece for a breakdown of the various combinations used by Norway in their qualifying campaign for the 1994 World Cup. Going down a similar route with the same design – bar the older stripes – and trefoil were Portugal. Oddly, their previous shirt hadn’t been that different, using a similar design to the one Colombia had had at the 1990 World Cup, but yellow replaced white as the third colour here. There were two versions of the Portugal shirt, with the second adding a fabric pattern featuring the trefoil – used by Hibernian a few years previously – and with an FPF monogram on the neck. When Portugal changed against Malta in 1993, it was a white version of this that they used. It wasn’t just in Europe that these discrepancies existed, though – Nigeria wore the new-style shorts and socks but with older shirts while Argentina never had an Equipment shirt. They still carried the trefoil when they won the 1993 Copa America and another South American country also had the older mark at that tournament, but with the newer kit elements. 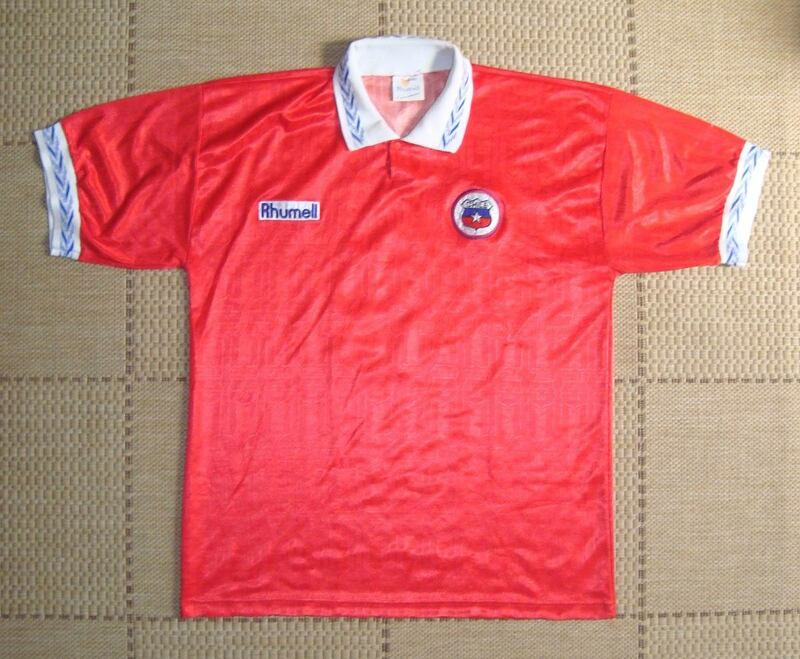 However, whereas Cork City’s three bars on their shirt had been a bit more vertical than normal, Chile’s were angled slightly more in the other direction. Adding to the locally produced feel was the fact that the neck differed slightly from the more common version and it didn’t house the trefoil. Instead, that appeared close to where it would have on the previous generation of shirts. Just for good measure, the shorts featured the adidas wordmark, diagonally on the middle stripe. It was to prove to be their last adidas kit, with Brazilian brand Rhumell taking over. Similar to sound-alike brand Hummel, the new maker also featured chevrons on its offerings.